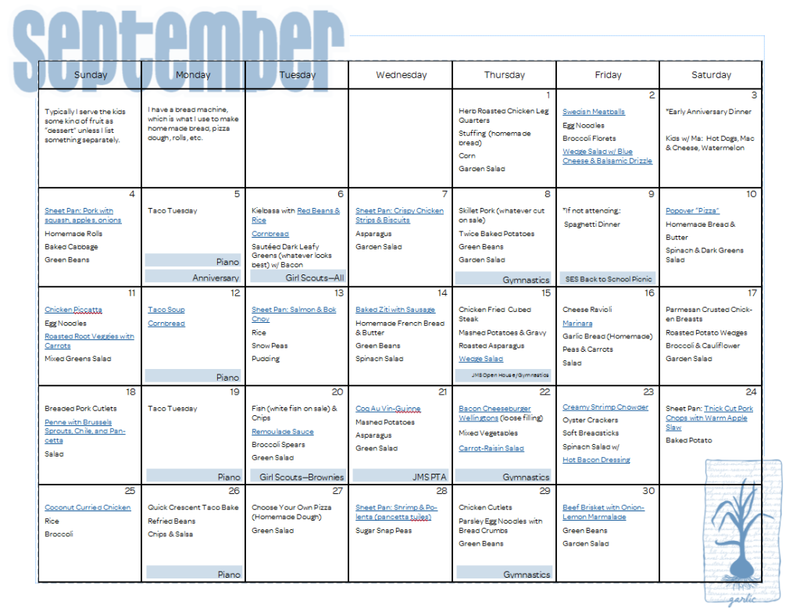 Overall, I did pretty well sticking to my September meal plan. I was flexible enough when I found a really good sale, and a few days got switched around, but for the most part I stuck to my meal plans, stuck to my shopping lists, and had very little waste this month. In October, I planned several cook protein once, eat 3 times kinda meals, utilizing leftovers from a pork roast, roasted chicken, brisket and ham. School started Monday for my kiddos. It’s hard to believe that Kidlet is in 7th grade this year, and Baby L (Bean) is in 2nd grade. 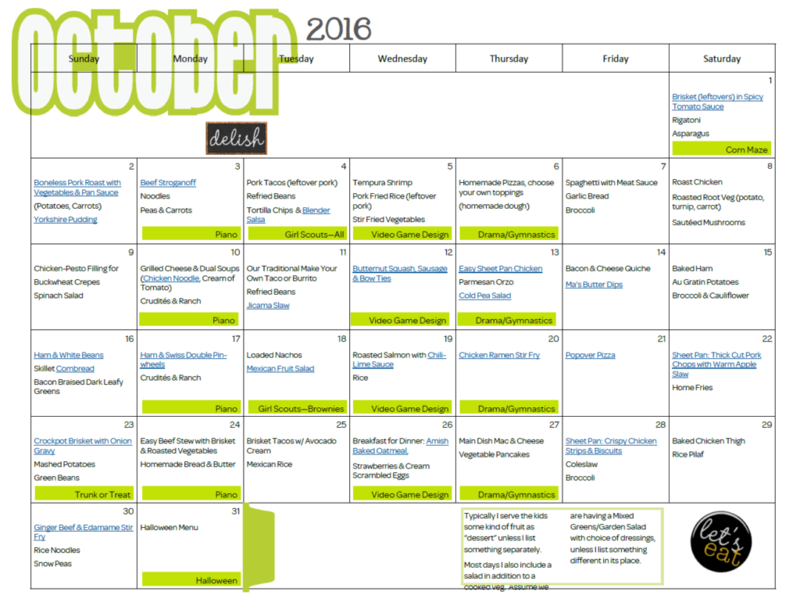 Failing to plan… planning to – you know the rest! What happens when I don’t plan ahead? Well, its the tired cliché I remember spouted out at every weight watcher meeting I ever attended — if you fail to plan, then you plan to fail. For me, that mostly means meal planning. Not just for health and weight loss purposes, but if I don’t meal plan, I often end up floundering at dinner time. I forgot to take out something to thaw! Yikes! What am I going to make for dinner with XYZ? What do I have that goes with it? I need a store run. Oops, I took out a roast to thaw, I should have gotten that in the oven an hour ago for dinner in an hour. Ugh, I am just too tired to deal with it. Especially the last one; high sugars had made me so lethargic (I didn’t know this was the issue at the time), I would literally be falling over tired; so exhausted that I could not keep my eyes open, no matter what I did. Even when not quite that tired, the other excuses would weigh more heavily on me, and we either end up with the same boring old dinner again and again, or more likely, hopping in the car to go out to eat or bring home take out. I never used to notice this, or realize why I was cooking at home so little, but after resuming the habit of meal planning and doing it faithfully for a good 6 weeks or so (even before I started watching my calories), I noticed today that I was floundering at dinner time, and had been for a couple days, and suddenly it knew exactly why. Ohhhh, my last planned menu was that pulled pork on Saturday. I sat down several times with my meal planning binder to do my meal plan, but something kept getting in the way. I had the general idea of the week in my mind, and I’d taken out some meats to thaw, but I never got it down on paper with sides and such. If you find yourself struggling at meal time, whether it’s breakfast, lunch, dinner or all three, I recommend trying meal planning for a few weeks and see how it really reduces the meal time stress. I personally like the planner from The Project Girl, but even just jotting down my weeks worth of meals on a scrap paper works. Did well last week. Switched a couple of days around, and one day DH really wanted to order pizza, but otherwise I stuck to my plan and stayed in my food budget. Even when not listed, I generally serve green salad and some kind of fruit at dinner each night. This post is linked to Menu Plan Monday at Organizing Junkie. Check out the hundreds of other menus posted. Menu plan Monday! Long time no see! Even when not listed, I generally serve green salad and some kind of fruit at dinner each night. Next week the kids are both in mild learning mode with a food theme. The soups on tuesday and thursday are recipes that kidlet will be making. I didn’t have a menu plan last week, and it really showed. Between no plan, and the hubby’s 3 day in a row craving for fillet o fish — well, we didn’t eat that well! There were also no bentos this week. Well, there were lunches packed in bento boxes, but not packed well, and not really in bento style. Monday is the only day of school left before Thanksgiving Holidays, so I probably won’t be posting bentos again until the 30th. Thursday: Thanksgiving. We are eating out this year. I’ll miss the leftovers, but I’m not up to all the work it takes with a six month old. Mom can’t make it, but we’re meeting my brothers and their families for dinner, and then going to have desserts at one of their homes. For breakfasts we always have oatmeal, cold cereal, scrambled eggs, toast, freezer muffins, yogurt, cottage cheese and fruits to choose from. I also keep us stocked with lunch meats, cheeses, fruits, veggies, etc for bentos. Even when not specifically listed, I usually have a mixed greens salad and fruit available for dinner. A few months back, Family Fun Magazine had a project to create the “Ultimate Homework Station“, using a tri-fold display board (often used for presentations, found in office supply stores). Thier version was designed to actually store all the supplies needed for homework, and then to fold up for easy storage. I don’t really need it for its original purpose. I have an inexpensive short tower of drawers that I use to keep all our homework and learning materials together. But I am always juggling reference items when he is doing his homework and practicing academic skills. Since we are working so hard on his handwriting, having the handwriting card easily visable during work time is vital to us. Horizonally on the table, it would get shuffled under other papers, mislaid, and beat up. So I altered the idea of the homework station to provide a space for reference materials. A few things are permanently affixed (the plastic sleeve the handwriting card is in, but the card can be switched to something else, the large paper clips holding the cards on Oregon, Washington and California, but of course the cards can be changed, the red envellope on the right that currently holds parts of speech cards, the “blackboard” paper with the sight word post it notes) but the majority of things are attached with repositionable adhesive so that I can easily change things out as he masters whatever topic is highlighted on the board at the moment. When our formal learning time is over (and he is only five, and in Kindergarten from 8 until 2. Formal “homework” and academic time is limited to what he can tolerate, often only 10-15 minutes), I can fold the board up and tuck it behind the tower of drawers for storage. In addition to making the information easy to spot, I am hoping that the board will help shield him from distraction. I *just* made this and haven’t had a chance to see how well it works with the Kidlet, so we shall see! 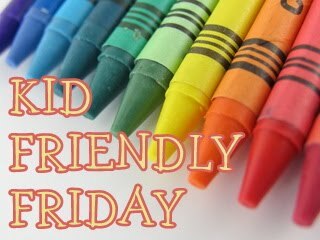 This post is linked to Kid Friendly Friday at I Blame My Mother. Check out this weeks linky for more kid friendly ideas! On a side note, Kidlet is really *really* struggling with his handwriting. We practice every day. I have three different books that I use for worksheets, I create my own on wide ruled paper that tie into to whatever phonic sounds they are learning that week, and outside of formal learning time I have him helping with making shopping lists, writing letters for grandparents, etc and I have offered lots of fun fine motor activities. At this point, I’m not sure it is those fine motor skills that are lacking. He has no difficulty manipulating small items, using tongs to sort marbles, doing puzzles, operating eye droppers for eye dropper art, cutting with scissors, or any of the plethora of “fun” activities I have contrived in our pursuit of legible penmanship. He is a whiz with a keyboard and mouse, or with game controllers. He can also *trace* letters just fine, with very little wavering or going off the lines. He brought home the class ‘pet” (a stuffed animal in a dog carrier LOL) and with him came a journal that each child writes in to record the happenings with the pup. It really hit home how truly atrocious my son’s writing is seeing it side by side with the other children’s entries. He has no trouble composing his thoughts on what to write. He spells things correctly (when you can read it to tell!). He just has a terrible scrawl. Letter formation, sizing, spaces between words, and line-alignment are all off. I’m at a bit of a loss and would welcome any suggestions! I did not stick well to my plan last week. I ended up not getting my shopping all done for the things we needed. But on the plus side, I didn’t actually shop for anything that wasn’t on the plan either. We had pizza one night (mom was in town), and went out one night (had a birthday party to attend) and otherwise cooked from the pantry and freezer, so I can’t beat myself up. Too much. I only managed to stick to my menu plan for half the week last week. Going to carry over a couple recipes since I have the ingredients for them. Did pretty well last week. This week we have a couple new recipes and some old favorites. 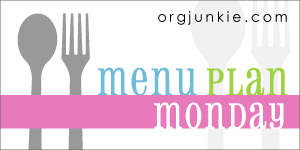 This post is linked Menu Plan Monday at Organizing Junkie. Check out the hundreds of other menus posted.